Skylights and UV filters were primarily intended to reduce the amount of UV light entering your camera. If you take a landscape photo on a sunny day with and without UV filter, you’ll probably notice that the first has a more “clear aspect” than the second, specially on distant objects (mountains, etc.). UV light can create a “blue haze” on your photos. But there is one more important function for UV filters which is equally important whether you use film of digital, and that is PROTECTION. Your lenses, through use, are constantly subjected to dust, scratches, humidity and so forth. Adding another layer of glass can protect your front element to a huge extent. If you drop your lens, having a UV filter or skylight attached can mean the difference from spending another $15 on a new filter or anything from a couple hundred dollars to a couple thousand on a new lens. Is this enough to convince you? If not I can give you my example. Some years ago, still with my film Pentax, I was just walking around the city as I sometimes like to do. My camera was hanging from my shoulder (something that I never did again) and, when climbing some stairs, to let someone pass, I stepped to the side. Result… camera hits rail, and all my blood evaporated at the sound of braking glass. I was too afraid to even look at my lens and seeing little pieces of glass on the floor didn’t help. 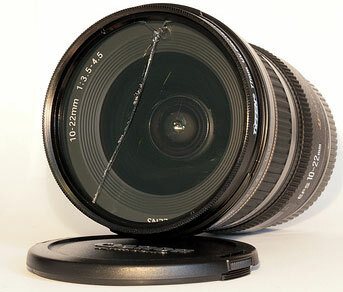 But ok, damage had to be reviewed and I was already thinking about the price of a new lens. Fortunately the pieces of glass came from my skylight and the front element of the lens was not even slightly scratched. Having that skylight there probably saved me about $300. Even if the lens glass had not break for sure would have been scratched rendering it useless. Two lessons in it for me: carrying the camera hanging from the shoulder is dangerous and a skylight or other inexpensive glass means a huge level of protection. Of course there are those who think that adding a $15 glass to the front of a $1000 lens can only mean a decrease in quality. My only answer is, a scratch or a broken lens definitely lowers the quality of any photo you try to make. If you are so concerned, just remove the filter before any important photo. I have one UV filter for each lens I carry and they all live happily together. And you? What lives at the front of your lenses? Nothing more true. A UV filter already saved one of my lenses. On other case, not even the filter was able to stop my front element from becoming scratched. As I mentioned in the post, $15 or a new lens… It’s the users choice.